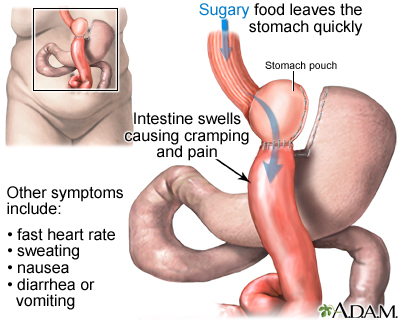 Dumping syndrome occurs when the contents of the stomach empty too quickly into the small intestine. The partially digested food draws excess fluid into the small intestine causing nausea, cramping, diarrhea, sweating, faintness, and palpitations. Dumping usually occurs after the consumption of too much simple or refined sugar in people who have had surgery to modify or remove all or part of the stomach. Updated by: Joshua Kunin, MD, Consulting Colorectal Surgeon, Zichron Yaakov, Israel. Also reviewed by David Zieve, MD, MHA, Medical Director, Brenda Conaway, Editorial Director, and the A.D.A.M. Editorial team.